PORT Moresby School of Excellence (POMSOE) caused a major upset in the Port Moresby premier soccer elimination finals when they defeated University 2-1 at the Bisini Park on Saturday. The young guns came out firing from all cylinders to make their presence felt against an experienced University oufit. Skipper Cyril Muta, Lab Embel, Rodney Mobiha, Poesi Pikot and David Brown were impressive and performed beyond expectation. 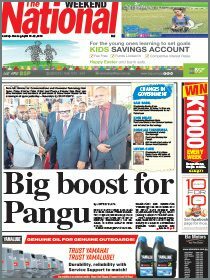 Muta, a national representative and Embel and Mobiha, who were part of the PNG U20 to the Oceania World Cup qualifiers in New Zealand recently, proved they were a side to be reckoned with this season. However, it was University who were the first to score to lead 1-0 going into the break. With some support and encouraging words from coach Wayne Taylor and parents, POMSOE lifted the tempo in the second half which resulted in Muta firing a powerful strike towards the University goal area. University goalkeeper Ben Kaiah misjudged the shot which deflected from him and landed in front of Embel who tapped it to level 1-1. Several minutes later, POMSOE goalkeeper Charles Lepani belted a long range kick that found an unmarked David Taylor. Taylor beat the University defence before firing the second goal to put them in front 2-1. POMSOE switched to defensive play. Despite University making some promising moves to find an equaliser they were kept at bay. They will meet Mungkas in the semi-final this weekend. Mungkas lost to minor premiers VAT Yamaros 2-0. Yamaros have booked the first grand final spot and will await the winners of the match between Mungkas and POMSOE. In the women’s premier division, University beat Guria 2-0 to take out the premiership. 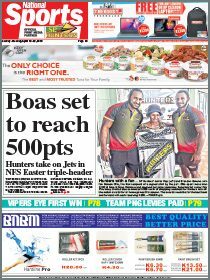 The Port Moresby Soccer Association will be staging an elite competition, the Super League for promising players. The competition will involve 10 premier teams. The top women’s premier and U19 teams will vie for the President’s Cup. Port Moresby Soccer Association president Russel Tsuga said there would be prizes distributed to the finalists.